We are from Louisiana and have owned condominiums in the Destin area for the past 30 years and still loving it! Our condo is well taken care of and newly remodeled. I keep the condo stocked with all of your necessities. We love the over sized private balcony area and large bedrooms. There is a Florida state park and serene beach area in walking distance to the East of our condo property, which we enjoy very much. Just a few steps away and it feels like you have your own private beach! The tennis facilities are immaculate and there are a lot of outdoor activities. The grounds of Tops'l Resort are very well maintained and manicured. Tides at Tops'l is one of the most sought-after resorts in the Sandestin area. Enjoy breathtaking views of the beautiful beach and bay from this 11th story unit, which is next door to a Nature Preserve to give you unobscured views from your bedroom windows! Relax on the large balcony overlooking the beautiful Gulf of Mexico. 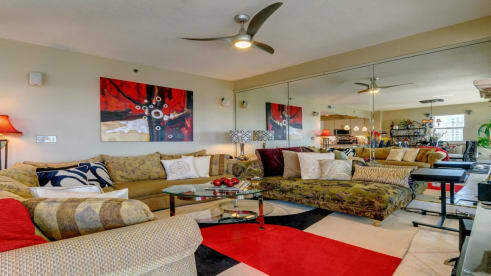 This condo was professionally decorated and has all that you need to enjoy the comforts of home at the beach. The master bedroom has a large king sized bed. The master bath has a large jacuzzi tub, separate shower, and double vanity. The guest bedroom is furnished with a king bed, flat screen HDTV, and walk in closet. The living room is complete with a flat screen HDTV DVD and stereo system. The Tops'l Resort is one of the top 50 tennis resorts in America. The upscale fitness center has just completed multi million dollar renovations and features fitness floor with weight and cardio equipment, personal training, massage, and locker rooms. Play a game of tennis on any of the clay courts or have a cocktail and lunch at the beach front pool. For dinner, have dinner at the award winning Ocean Club, which is located at the entrance. Children's programs are offered each day during the season. Silver Sands Outlet Mall, one of the largest in the US, is less than five minutes away. You will be three minutes from Sandestin's popular Baytowne Wharf where shopping, fine and casual dining, and entertainment await. Concerts and family movies are popular family outings on the lawn at the Wharf.